Last week I showed a new color on Norev’s 3" Peugeot 205GTI, today I’ll show a new (-ish) released color of the GTI’s ancestor: The Simca 1000 Rallye. And this bread box might just be the car I’ve featured the most on French Fridays, it even was subject in the first LaLD-post I ever did. ...we see the SRT Dragon. SRT. For Simca Racing Team. Which actually was a thing! SRT was founded in 1972 as a way for young people to have access to motor sport competition at lower costs. 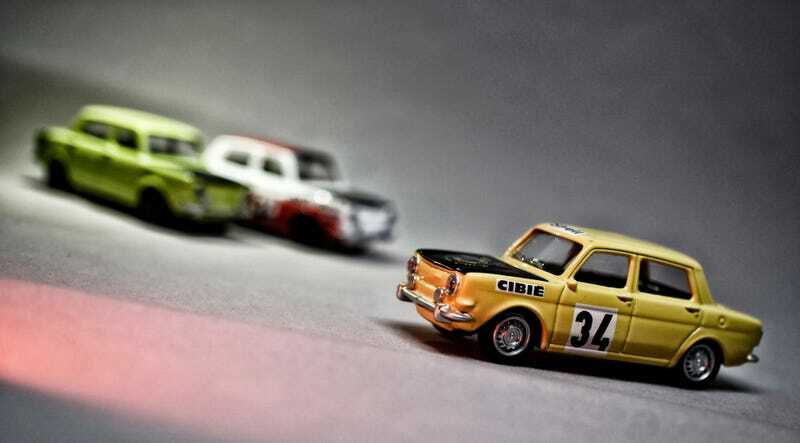 It was instigated by Henri Chemin, manager of Simca’s competition department, and William Reiber, head the Simca-Chrysler board of directors. And the SRT was divided into regions. Many, many cities had their own regional SRT: Dijon, Lille, Toulon, Villemomble, Montargi, Pau, Vierzon, the list is endless. Focus is mainly on track-events and hillclimbs. Names like Guy Fréquelin, Bernard Beghin and Michel Pignard all had some history with the SRT. And Bernard Fiorentino, a name you will hear more of in a future French Friday. TFritch might have an idea what car is featuring that future post. The Simca Racing Team didn’t survive all hoop-la the Simca organization was going through. After 9 years of existence it was killed already again as Peugeot Talbot Sport was taking over all competition elements and Simca actually didn’t exist anymore anyway: It’s models were mainly renamed Talbot already. Jean Todt was Peugeot Talbot Sport’s first director, sure most of you know the guy already. Only thing this new colored Simca is missing is those steelies the other two colors I already had do have. And, as it was probably tracked intensively: Where’s that roll cage Norev? I also got some new dioramas from DioPitlane. They’re supposed to be 1/43 but smaller than my usual DioPitlane dioramas. But that’s perfect for 1/64 or 3"s actually! Okay, that dotted line... Well, let’s just say that’s where the bicycles are supposed stay next to! I was extremely lucky to find these as the company who made those doesn’t exist any more and didn’t make many in the first place.